Here there be dragons. You never know what you’ll find when you set foot on unexplored territory. Brisbane’s Grand Atlantic is venturing into uncharted waters this year with a new album and tour to support it. The power pop quartet recorded their as yet untitled third record in Seacliff Lunatic Asylum, an abandoned psychiatric hospital near Dunedin, New Zealand, where they delved into darker emotional territory, experimented with new recording techniques and experienced the effects of their haunting (and possibly haunted) surroundings. They will bring the psychedelic results of their explorations to the United States this March, playing gigs in Chicago, New York and at SXSW, kicking off in Chicago at Reggie’s Music Joint on March 11th. 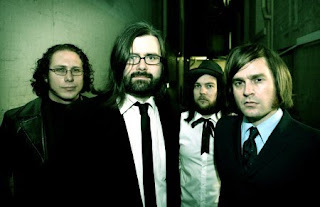 In March 2010, Grand Atlantic barnstormed across the US and Canada after invitations to showcase at SXSW and Canadian Music Week, following extensive touring of the How We Survive in Australia and a growing call from the US powerpop scene. The release of the album in the US prompted radio play on over 50 radio stations, a glut of media attention and placed them on a bunch of SXSW ‘bands to watch’ short lists.